TORONTO -- Construction workers, building security guards and cleaners under government contracts would receive a "fair" wage under legislation Ontario's governing Liberals introduced Tuesday and hope to pass before the June provincial election. The new legislation -- called the Government Contract Wages Act -- would establish minimum pay rates for workers in those sectors and require contractors and subcontractors hired by the government to abide by them. "It means that if you work on a government project ... you will be paid fairly. Full stop," Premier Kathleen Wynne said as she made the announcement at a union training facility for plumbers and steamfitters in Toronto. "This is about preventing employers from undercutting workers' wages in order to lowball on provincial projects." Wynne said the bill will update fair pay legislation that has remained unchanged since 1996. Trade organizations have lobbied the government for the update for years and the Liberals have spent the past 12 months consulting with stakeholders, she said. "We're tabling legislation to enshrine the principle of a fair prevailing wage in law as well as provide the necessary support and enforcement to make it work," she said. Patrick Dillon, the secretary treasurer of the Provincial Building and Construction Trades Council of Ontario, said the legislation will not only help protect worker wages, but ensure safety on the job. "When contractors are bidding and one is lowballing the other, they have to cut some place and generally they start to cut at health and safety," he said. "We think this is a big step in the right direction to help with prevention." Dillon acknowledged that the move may not be popular with all contractors in the province. "Some contractors may complain about this," he said. "But their workers, for sure, will not be complaining." The move comes months after the government passed major labour reforms that included minimum wage hikes -- it jumped to $14 an hour on Jan. 1, and will rise again to $15 on Jan. 1, 2019 -- and equal-pay measures for part-time and casual workers. David Frame, director of government relations at the Ontario General Contractor's Association, said his organization had no idea the legislation was coming and the news caught them off guard Tuesday. They consulted with the government on the wage schedules a year ago and hadn't heard anything since. "What surprises me is they don't need legislation," he said about the updates. "They have the (regulatory) authority to bring the schedules up to date." Frame said the association doesn't challenge the premise of the fair wage scale, but the skilled trades are so competitive at the moment that if a worker feels he or she isn't receiving fair compensation, they could find other more lucrative work in the field. "They're trying to make employers look like the bad guys, like we're not paying our workers properly," he said. "I know of no workers who are going to be helped by this at this current time." Wayne Peterson, executive director of the Construction Employers Coordinating Council of Ontario, said the industry welcomes the new bill and would have liked to have seen it introduced earlier. The Liberal legislation should spell out how the new rules will be enforced, he said. "It's fine to pass legislation, but if it has no enforcement and no teeth, then it's just frivolous legislation." Wynne said she was optimistic the new bill would become law before the election, slated for June 7. Labour Minister Kevin Flynn conceded, however, that the co-operation of the opposition Progressive Conservatives and New Democrats would speed up passage of the legislation. 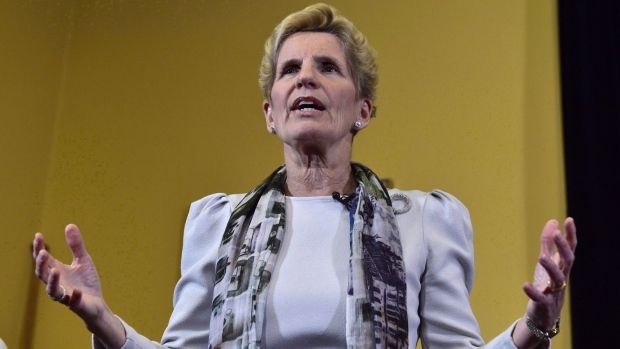 "I think if you believe in a fair wage policy for the province of Ontario and you're one of the opposition parties I would hope they would co-operate," he said. "A co-operative house could ensure that this would happen for the people of Ontario." NDP Leader Andrea Horwath said the timing of the announcement, weeks before an election, says more about the government's desire to position itself before the vote than it does about its dedication to workers. New Democrats may support the legislation but want to have an opportunity to examine the bill, she said. "This is what makes people so disappointed with Kathleen Wynne and the Liberals," she said. "They could have upgraded the fair wage policy for years now. In fact, they were stringing a lot of these workers along." The Tories also criticized the government for the timing of their legislation. "Kathleen Wynne and the Liberals have had 15 years to stand up for workers in Ontario," labour critic John Yakabuski said in a statement. "Now less than a month before the election is set to start, the Liberals are introducing a bill that they likely will not even have time to pass."